ggh wrote: Gee, looking at the list of online folks, you're the only heavy hitter here Hal. Of course you are, and one especially appreciated by me. For some reason the DONG won't work for me. tman2nd wrote: Actually we don't know what happened to Helper. Isn't there evidence that he returned as cmyk? There is. I was the one who pointed that out, but it's unconfirmed. Thank you, oh patriarchal one. I can't really let you take the blame, but well, since you offered, sure! SWO Crash wrote: Having been a follower of Time since almost the beginning (NP 9, 10?) and a reader of the needle-pulled-thing off and on (because, honestly, it's fascinating), I have come across this pondering - might the followers of Time find a kinship with the members of the (U.S.) military? After all, we are told to "hurry up and wait (for it)." Peace and the blessings of Time to you all. Although in Time we don't have the "Hurry up" part, just the "Wait for it." But as we are all waiting, I would say there is indeed a kinship. Peace to you as well! Probably the last American up here, just been catching up on the 7+ pages I missed today. Unlike certain other users who I could mention (you know who you are), I actually read the day's newposts... It takes a certain amount of mentally unstable dedication to do so, but I do it anyway. Better than Outside entertainment, anyway. Maybe the design is sweeping eastwards across the globe? Maybe this is all a metaphor for how we view ourselves as civilized even if others were demonstrably more so hundreds of years before? Maybe we're all reading into this far too much*? *That would NEVER be the case. I'm still around. Been working late nights, which gives me good reason to avoid coma, as well as keep checking in when I feel like slacking. For the record, alas, I am not helper. Nor is helper, I. But I did bury his body somewhere out there in the desert. Edited to avoid double post. ChronosDragon wrote: Probably the last American up here, just been catching up on the 7+ pages I missed today. Nope, I'm still up, here on Pacific time. It's pretty lonely at the moment, though better than it was about 20 minutes ago when it was just me a couple other users, and a couple of bots. Must be time to coma. Anyway, got my first GONG. I'm happy. Ah, you are not helper, but are you Helper? But I do make a mean Hamburger Helper. I'm on Pacific time also. 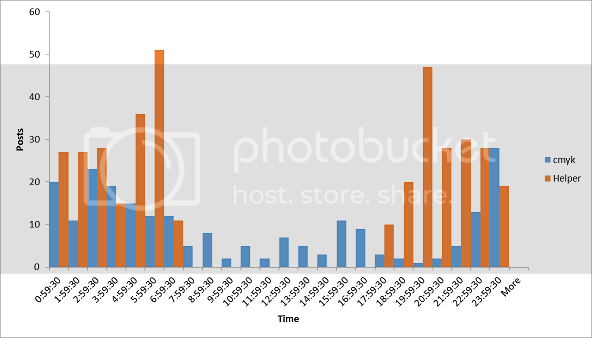 Well, according to this graph, cmyk and Helper's posting habits don't line up, so I don't think they're the same. You may see a graph, but all I'm seeing now are sandcastles! I can't stop seeing sandcastles! You have to wait 9 days for the weather to pass and the flood waters to recede before continuing on your Quest. About mid morning you come across a poor soul who got stuck in the mud and must have drowned in the rising flood waters. It seem someone has found him already and stripped anything valuable and left him propped up on four large bricks. You continue on your westward quest for two more days before coming to a deep chasm. Their is a rope bridge to the north but as you approach it find an old man with a bunch of viscous looking Dogs. They look like Rottweilers and you can count 13 of them. When you get within ear shot of the man he speaks up and in a very strange accent says: "Qba'g jbeel nobhg gur qbtf. Lbh pna pebff vs lbh jnag. Whfg qba'g jnyx onpxjneqf nf gurl ungr gung naq znl nggnpx!". You try to talk to him but he seems not to understand your speech either. Actually, my first post in this thread was in the first day, by most ways of reckoning it. It just wasn't quite within the first 20 hours 40 NewPices; just 3 NewPices too late to make that cut. Oh right, I was wondering if there was somewhere that automatically stores the hashes. Good to know that posting them here is not necessary. 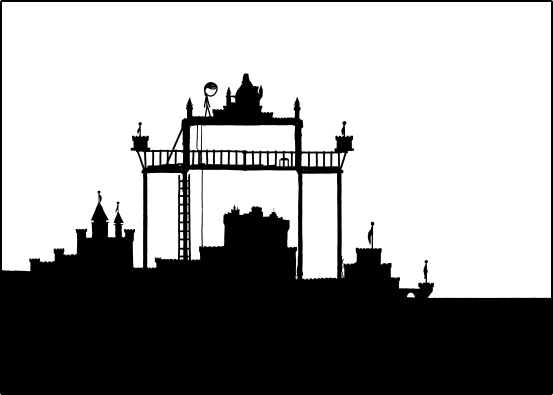 That top level is beginning to look a bit like Makaryev Monastery (as featured in the film Salt (another photo here). 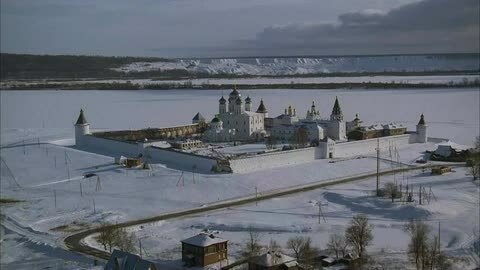 Eutychus wrote: That top level is beginning to look a bit like Makaryev Monastery (as featured in the film Salt (another photo here). I can see what you mean, but I'm not sure that it looks any more like that than any other castle-y building in a walled compound, especially given that it lacks the little bridge, and cantilevered tower, etc. And I've never bought any of the ideas that any particular sandcastle is supposed to be representative of something from the Outside. If you do want to help, The Book of Time needs working on. Look at how long I was lurking! I made a new feature- multiple people on one graph. Hal9000 and buffygirl are neck and neck, racing for second place. Who will make it? Gaaaah why fork we both do the same thing pretty much. Indeed. It seems unlikely that they don't understand the sea (big! ), don't know if there's more than one river (small! ), but do have in-depth knowledge of Outside castles. Huh. I was POTP last page under the old rules, and all I did was announce that I was going to coma. Ah well, you all escape my Papal tyranny. This time! Oh, now that's just promoting competition. Also, could somebody post the newpix for our newpage? I can't from this iPad.